With Cricky in NYC, and Alan, Ben and Nobby having ridden yesterday 3 of the PEAKY CLIMBERS decided to ride today: JB, Stewie & Macca. A 7.50am start for Macca, swinging by and meeting Stewie at 8am they both headed off towards Uffington. A beautiful syncronised meet with JB bang on time and the boys were soon heading out towards Highworth. With JB having ridden 50+ miles yesterday and Stewie having not ridden for 4 weeks due to him winning the ‘sick note’ certificate from Ben, it was planned to be a tough ride. A decent 30 miles to Wootton Bassett passed without any major incident or drama. The weather was 2 degrees, but the wind chill meant it felt like -2!! There was early rain, the sleet staying away but the wind was whipping up nicely. The new route took in a couple of major hills and some really undulating countryside, which meant the guys were planning to climb over 1,000m in total over the 67 miles. As the ride progressed the rain stopped, but the wind picked up! Once past Wootton Bassett the PEAKY CLIMBERS headed towards the North Wessex Downs. The boys hit Broadtown, which peaked at 10.1%, but in today’s conditions it was tough! All 3 completed it strongly and pushed on towards the daunting Hackpen. The view leading up to Hackpen is breathtaking. You can see that it has a long uphill drag, before rising steeply towards the White Horse. The above photo shows JB blasting to the top, celebrating as he done so, with the misty weather in the background. All 3 Peaky Climbers climbed well, but there was more to come. The route took us into Marlborough for a well earned stop at the local Costa and coffee’s and the odd cake were consumed with ease. Once ready, a quick up hill from the coffee shop and heading off towards Hungerford. This stretch of road was absolutely stunning. A great undulating cycle that challenged on the long up’s, allowing you to get into a rytham as we pushed on. The scenary was stunning, even in this weather and all agreed that re-doing this route in the Spring and Summer is an absolute must! Once into Hungerford, the route took us towards Great Shefford. First a number of steep hills and long drags that took us past the M4 junction, up and then down into Shefford. 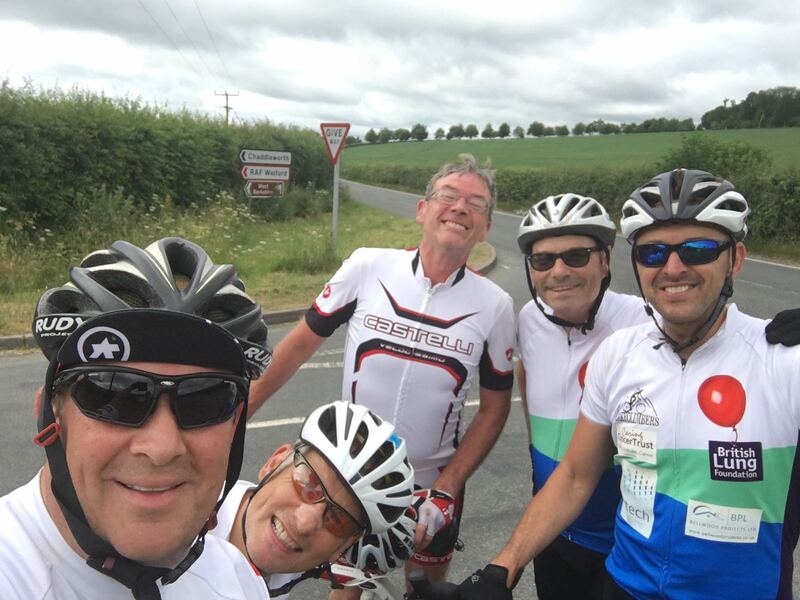 The A338 from Shefford to Wantage is full of challenging undulating roads, this coupled with a strong head wind meant the pace was challenging to maintain. Stewie did great for his first ride in 4 weeks, a real positive Peaky mentality. Also, JB, being able to continuously push right to the end after 50+ miles yesterday just shows how much stronger he is now getting! 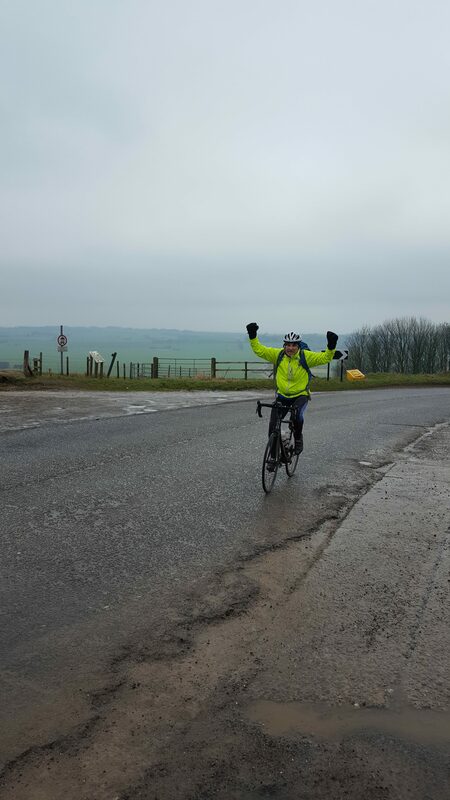 Stewie arrived at the Ridgeway cross roads like a Gorilla in the Mist! JB took a left to Letcombe and home, whilst Stewie and Macca sped down towards Wantage to complete what was an awesome ride for all 3! Next week…More of the same!! !